The Friends of Brinsley Headstocks . New Members always welcome / See us on Facebook as well ! Brinsley is a small village just north of the town of Eastwood in Nottinghamshire. 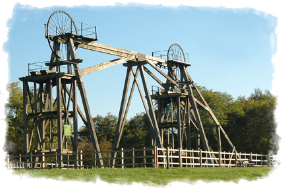 The Friends of Brinsley Headstocks are a voluntary community group, formed over 10 years ago, who help maintain and develop Brinsley’s old mining site. We work in partnership with Broxtowe Borough Council and other groups to develop the area as a heritage and nature reserve, an amenity for our community and a focus for the mining and literary heritage of our area. Over the years many local community groups have assisted the Friends with the project and all this hard work received national recognition on the winning of the prestigious Green Flag Community Award in 2016, 2017 and again in 2018. Please come and join our group. Volunteers are needed to help us fulfil our annual programme of working parties and committee meetings. Everyone will be made equally welcome. We meet at Brinsley Bowls Pavilion next to the Parish Hall at 7.00pm on the third Thursday of each month.